I was connecting in business from my Air France Rome (FCO) to Paris (CDG) flight and had a few minutes to spare prior to my Delta flight to Newark (EWR). Is this business or first?? 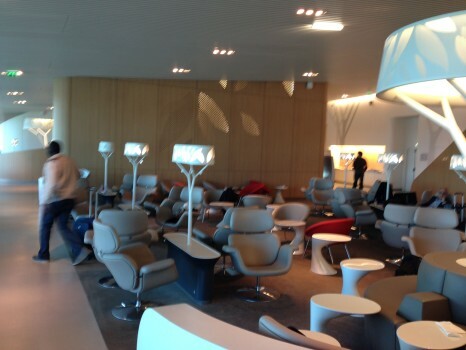 ?i ve passed by terminal E at least 50 times and visited tge downstairs lounge,looks different and tge food spread i ve never seen such at any air france lounge and i am FB platinum fir life so i know what i am saying. Business Class – I have been there twice, and it is quite nice and HUGE! To get there, go straight through the Duty Free area and go straight until the you hit the back wall. Continue straight (look for the signs like the ones in the photos). It’s located in the 2E satellite 4 for M gates. Unfortunately this satellite is close the afternoon and so the lounge as well. The other lounge in 2E are not so good, this one is exceptional. They refreshed the lounge in 2E gates K but I didn’t have the possibility to test it, since one year my departure are always from gates L (grrrrr) and unfortunately in cdg 2E it’s quite impossible to change terminal due to the PIF configuration (luggage control). I like the lounge in the F terminal (European flights) even if their is no champagne on them (grrr 2) a tips go downstairs it generally calm with the same drink and food offer and you can better see the Tarmac.